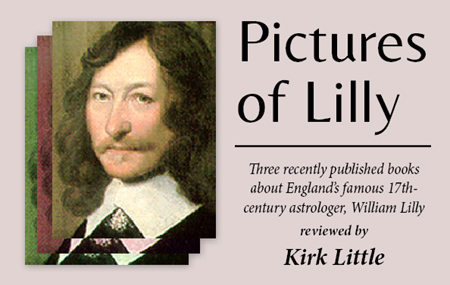 Was William Lilly (1602-1681) the quintessential everyman's astrologer, or the last in the line of magus-practitioners whose true accomplishments are largely hidden from view? More pointedly, was he a technically gifted astrologer with a shameless talent for self promotion, or a serious occult practitioner, whose most famous predictions owed more to the hermetic arts than astrological skill? This appears to be the dichotomy presented by two recent books on England's most famous astrologer. A third book, a richly annotated edition of Lilly's autobiography provides support for both views. What is the interested reader to do? It seems our pictures of Lilly fill a need, but which need exactly? Certainly he reminds us of astrology's high water mark during its last great flowering in the West, when his advice and counsel was sought by men in the corridors of power and women wondering whether they would find a husband or recover one who had wandered off. Obviously, his busy (and lucrative) practice —in his heyday, he saw over two thousand clients a year— would be the envy of many contemporary astrologers. We may also covet his evident comfort with his metaphysical assumptions about why his astrology worked. Lilly seemingly suffered no angst from attacks by the scientific scolds and religious fanatics of his day; indeed, many of them sought his services. His astrological colleagues were another matter. That said, many readers may sensibly ask: do we need more books about Lilly? Apparently, yes. Intentions count for much here. Caves hopes to introduce the uninitiated to Lilly and to demonstrate his continuing relevance to contemporary astrologers. He knows that more than traditional techniques come between modern readers and their ability to grasp the subtleties of Lilly's selective telling of his story; his volume provides careful research and clear explanations for all those 17th century English colloquialisms, which we may think we know the meaning of, but usually don't. The other authors are after bigger game. Catherine Blackledge seeks nothing less than to place Lilly on a historical pedestal along with those other 17th century giants of English history: Oliver Cromwell and Isaac Newton, by highlighting his political importance and his singular predictive achievements. Stockinger and Ward take Lilly's significance for granted, but wish to recover the actual reasons for his success within a lost world of magic and talismans. While both the Blackledge and Stockinger/Ward books are based on sound scholarship and concern themselves with Lilly's actual methods and practices, it is safe to say they are aimed at different readers. Neither, properly speaking is a full scale biography: Blackledge primarily keeps her focus on the twenty odd years from Lilly's rise to prominence in the mid 1640's to his post Restoration downfall following the Great Fire of London in 1666. Her style is open and inviting—she wants everyone to know the accomplishments of her hero. By contrast, Stockinger and Ward come across as more guarded and protective of their man; they want academics and other trespassers onto the Lilly turf to treat him like they would any other figure of historical consequence: by knowing the Lilly primary literature and not relying solely on second hand opinions. To that end, they provide their reader with a pot pourri of primary sources and an annotated transcript of Lilly's autobiography along with a running commentary meant to "correct the myriad errors found in various biographies of William Lilly. "5 Clearly, their book is aimed at serious students of his work. Taken together, these three books remind us how far astrological scholarship has come, and yet how cloistered it remains in the wider world of academia. Perhaps that's as it should be. Or perhaps not. In a recent, well written survey of the Tudor and Stuart dynasties, Ronald Hutton, a historian steeped in the study of paganism and magic, doesn't mention Lilly or the role of astrology during the English Civil War.6 Still, it counts as progress that Professor Hutton described Blackledge's book as "a very exciting and colourful read (which) makes a plea for the enduring value of astrology on the way. "7 Of course, we astrologers know by now that the study of astrology as a historical artefact is all well and good, as long as the author doesn't seem to think it really works. Certainly, Lilly was a working astrologer, and some of his most famous judgments —say his prediction that the Parliamentary forces would be victorious at the battle of Naseby in 1645— seem strongly rooted in his astrological skills. This is the Lilly whom Blackledge trumpets. She has a lot of company, if the numerous accolades and endorsements by leading astrologers —beginning with Jonathan Cainer— are any guide. And why not? By the looks of it, she is hoping to find a readership outside the confines of academic astrology or even garden variety astrologers simply wishing to know more about one of their luminaries. To that end, Blackledge has authored a book that doesn't look like your typical serious topic publication. Watkins, the most mainstream of the three publishers on review, has produced a distinctive volume with a white cover embossed with maroon lettering and a rather ornate maroon-pink frame encasing a maroon-tinged engraving of Lilly, taken from the 1647 William Marshall frontispiece of Christian Astrology. Cracking the cover, one half expects to see an advert for scented candles and bath oils. Instead, the reader is rapidly drawn into the opening chapter "The Piss-prophet Rises", thus banishing any hint that delicate sensibilities will intrude on a good read. They don't. After a few pages, the reader is hooked. If her title The Man Who Saw the Future sounds as though it was borrowed from an Alfred Hitchcock movie, it also tells us, she clearly thinks his astrology was working. In a clever nod to the seven traditional planets used by Lilly, the book's seven chapters each have a planetary glyph in front of their titles hinting at their topic matter. Though her book contains several horoscopes, it is not her primary intention to unpack their meaning. She has a story to tell and doesn't choose to encumber it with excessive astrological jargon and technical minutiae. Her account is written in a brisk, journalistic style and is leavened with many Lilly anecdotes and set pieces, familiar if not to all, at least those who have spent time with his autobiography. These are occasionally revealed in creative coffeehouse or consulting room reconstructions, which may have no basis in historical fact but surely make for fun reading: "It was summer in the city, June 1664, and Lilly was sitting in Child's coffee-house…at this moment, he was alone in the sociable, noisy room reading a letter from fellow astrologer Thomas Heydon." (p. 149) or "Lilly's frown of concentration deepened. Sitting in his study at home in Hersham, he scrutinized the pages in front of him. Reaching the end of the pamphlet, he sighed and took a deep breath…" (p. 171). Indeed, one could imagine turning this book into a screenplay for a movie, no doubt starring Johnny Depp as the mischievous Mr. Lilly. The author seems to think as much, since she lets us know that in his most famous image —the 1647 Marshall engraving— "he sported the newly popular Van Dyke beard" (p. 47) made famous in our era by that actor. Blackledge is primarily interested in Lilly as a canny and technically accomplished astrologer, who was able to use his gifts to shape the world around him. Her Lilly is the consummate professional: assured, knowledgeable, shrewd and pragmatic, but also worldly and quite cunning. In terms of historical style, her book sits comfortably between Derek Parker's Familiar to All —novelistic, with nary a footnote— and the meticulous historical scholarship of Ann Geneva's Astrology and the Seventeenth Century Mind: William Lilly and the Language of the Stars. It wasn't until the publication of that book in 1995, that any academically trained historian had ever taken the time to learn the technicalities of astrology; Geneva used it to explore "the methods and mentality within which these astrologers practiced their art. "8 Blackledge also developed "an appreciation of the 17th -century techniques" (p. vi) and studied both the primary and secondary sources on Lilly, but by contrast, she wears her learning lightly. She is a wonderful storyteller, who seamlessly weaves the personal, the political and the historical threads together in a manner which should appeal to many readers, even those with a limited taste for historical nonfiction. What Blackledge shares with Geneva is a focus on Lilly as a skilled astrological prognosticator. Whereas Geneva understands astrology as a starry language, whose symbolic substitutions and cryptic omens require decoding for a twenty-first century reader; Blackledge is more straightforward in her approach and doesn't concern herself with what separates our understanding from Lilly's. Of course, the great appeal of Lilly for many readers is his unpretentious descriptions of his magical pursuits, not to say his astrology, so of a piece with his Taurean nature. As Lilly unabashedly informed his reader, he did not believe God "had bestowed those abilitys uppon mee, to bury them under a bushell"13 and he had no problem laying out the issue in his "Life and Times". As he matter of factly explained when discussing his justly famous 1651 Monarchy or No Monarchy woodcuts, he attributed them to "the more Secret Key of Astrology, or propheticall astrology…I thought it most convenient to signifie my intentions and Conceptions thereof, in Forms, Shapes, types, Heiroglyphicks etc. without any Commentary, so that my judgment might bee concealed from the Vulgar and made manifest only to the wise…"14 Stockinger and Ward seem to think that most of Lilly's biographers, by ignoring or minimizing his occult pursuits, have misunderstood him. In other words, because we can't take magic seriously, we can't see, let alone understand the inseparability of Lilly's astrology from this magical mindset. They have a point. If lending credence to Lilly's magical world view doesn't fall within the compass of academic historians, it is also true that it is not exactly a comfort zone for most astrologers either, who understandably remain intent on making themselves palatable to a contemporary constituency. But if Stockinger and Ward wish to take both academics and astrologers to task for neglecting this aspect of Lilly, they should have been more mindful and meticulous in their approach. The problem with their book is partly structural, partly tonal. To boot, the whole project is beset with a number errors and publishing glitches which distract the reader. For structural starters, the book is oddly organized. You know you are in trouble when it is not until page 257 that you read "The primary aim of this book is to correct the myriad errors found in various biographies of William Lilly." Without a doubt, their extended essay "Monster of Ingratitude" which begins on that page functions as the authors' sustained critique of current Lilly scholarship. Still, it is not clear why they didn't initially provide their reader with a coherent overview of their project or some rationale of placing the material as they did. Thus, while the first 256 pages contain a number of inherently interesting documents, they don't function as necessary precursors to their "Ingratitude" essay. Instead, these pages contain their useful introductory, and to this reader, all too brief essay followed by Sue Ward's edited and annotated version of "The Life of William Lilly" (the "Autograph"), a series of appendices containing Lilly's "License to Practice as a Physician", his "Last Will and Testament, a number of horoscopes of Lilly's friends and contemporaries, and Lilly's extensive astrological delineation of "The Nativity of John Wittypool". With the exception of their introductory remarks and some comments in an essay by Sue Ward on Lilly and Ashmole, none of this material advances their thesis of a more magical Lilly. More significantly, the authors don't provide their readers with a broader historical context of the relationship between astrology and magic. For example, it would have been helpful if they had enlightened their readers on the pertinent distinction between Renaissance magic's two broad strands: natural and demonic. Natural magic, fostered by the influx of Arabic learning "was really science as understood at the time"15 , that is effects brought about through the occult properties of nature. The rise of experimental science in the 17th century obliterated much of this strand by providing natural explanations in lieu of magical ones. By contrast, demonic magic, which also depended upon occult properties, involved an assumption that magic relied upon the interventions of demons. Thus, Christian scholars such as Thomas Aquinas "believed in occult phenomena caused by the influence of stars and planets, but tended to follow Augustine in reserving 'magic' for processes involving demons".16 Pagans, by contrast, made a distinction between demons and daimones (Latin, daemons), which were "neutral spirits, intermediate between gods and human beings and capable of serving either good or evil purposes. "17 By providing their readers with such an understanding, the authors could have more accurately placed Lilly's magical beliefs and practices. The issue of authorial tone similarly detracts from their book. Stockinger and Ward's "Monster of Ingratitude" essay, a hundred plus page account of the increasingly tempestuous relationship between Lilly and John Gadbury, exemplifies the problem. They focus on the decades-long feud between the two men "in order to demonstrate how a more wide-ranging selection of sources can reveal surprising information and lead to alternative conclusions" (p. 262). In short, they have a bone to pick with Lilly's leading modern historians, specifically Curry, Parker, and Thomas. The gist of their complaints concern these authors' failure to properly provide "the interested historian or astrologer with the exact derivation of the quotations from which they draw their conclusions." Have no doubt, Stockinger and Ward have done their time in the Lilly archives, but their petulance can at times be off-putting. For those wondering, the title of their "Ingratitude" essay derives from a handwritten remark Lilly made in his copy of Gadbury's Doctrine of Nativities, which he had damned with faint praise in one of his annual publications. The remark recurs in Lilly's autobiography (p. 69), which was not published until after both men were dead.20 According to the authors, this epithet "was not a simple angry outburst, (Lilly) chose his words carefully." Somewhat hyperbolically, they claim "It could have hardly been worse had Gadbury been charged with murder" (p. 295). This startling judgment alerts the reader to expect high drama in the pages that follow. Indeed, readers informed by Patrick Curry's Prophecy and Power might have hoped to encounter a philosophical duel between Lilly's magical attitude and "Gadbury's commitment to the transformation of astrology by Baconian methods into a more objectively verifiable science…"21 If only. Instead, the reader is treated to a number of exhaustive, and exhausting "Timelines" replete with full bibliographic references for 17th century astrological sources, which hammer home their point that Gadbury was a jealous guy, who resented Lilly's success and fame. One is reminded of the dispiriting, if common theme of followers overshadowed by their masters: think Mozart and Salieri, or Freud and Adler, etc. I would be remiss if I did not raise the issue of technical errors and publishing glitches. There is strong evidence that no one proof read the manuscript before it was sent to the presses. Here I should note that Mandrake is a "print on demand" publisher; it is unclear whether some of the book's problems may be attributed to that fact. On the plus side, it is a physically striking book: its black framed cover encases the "non cogunt" portrait of Lilly, which hangs in the Ashmolean Museum. The large pages are nicely laid out with a pleasing typeface. The most concerning problem is the issue of wandering footnotes. In their lengthy "Ingratitude" chapter, the book's footnotes drift away from the page on which the superscripted number appears. At one point, a footnote on page 279 shows up at the bottom of page 296. For anyone wishing to trace their sources, this is not only annoying, it becomes deeply frustrating. I found at least one missing footnote and two which were essentially duplicates. Another footnote was missing its text.22 Furthermore, the book lacks an index —also true of Caves' volume— thus making topic searches impossible. Even the Table of Contents mislabeled one of the chapters. A horoscope was omitted on page 291 and in its place, another was substituted, which had previously appeared in the book ten pages earlier. One is left with the impression that much good and original work doesn't reach its full potential due to relatively minor organizational issues. Wade Caves' "Life and Times" does what we expect of an annotator: help the reader cut through the fog of time by introducing us to the people, places and terms: antiquated phrases and words, as well as astrological references and allusions, which no longer carry meaning. Other than Stockinger and Ward's annotated version, there is only Katherine Briggs' The Last of the Astrologers,23 now scarce as hen's teeth. Naturally, what to annotate and how much information to provide is what distinguishes one work from another; beyond accuracy and completeness, there is the matter of taste and discretion. For this reviewer, Caves' version gets the job done more thoroughly than Stockinger and Ward's version, which frequently offers only single line descriptions of subjects. Caves' book also comes with a Lilly literature review of sorts in the preface, courtesy of Philip Graves, easily our most informed modern authority on extant western astrological literature. He helpfully places the recurring publication of Lilly's autobiography in proper historical context: 1715, 1721, 1774, 1822, for those wondering. Rubedo Press has used the 1822 version for their text. For those attuned to the physical properties of books, the Rubedo Press edition has much to recommend it. It is the smallest of the three books on offer — 5 by 7 inches— but does not suffer from that fact. Page design and typography are the most aesthetically pleasing of the three books and its supple binding makes it easy to hold and read. Annotation aside, its page content closely follows the version of "Life and Times' issued by Ballantrae Reprint in the 1990's, including the twelve engravings of various individuals mentioned in Lilly's text, such as Simon Forman, John Booker, Charles I & II and Oliver Cromwell, among others. Rubedo has wisely darkened the ink on the pictures and moved the two engravings of Lilly to more suitable locations. Caves' introductory essay is structured around five horoscopes: two event maps for the coronation and execution of King Charles I; two horary judgments made by Lilly: "Should Charles be Executed?" and his famous "If Presbytery Shall Stand"; as well as a horoscope for the Jupiter/Saturn opposition of 1653. For readers unfamiliar with the English Civil War, Caves' introduction is essential reading. His own glosses on the horoscopes are well rendered and give the reader some sense of how he uses horary astrology. Later in the introductory essay, he brings things up to date by placing Lilly within the context of the traditional revival of the 1970s to the present. He acknowledges the "cultural rift" opened by those traditional practitioners "who swing the pendulum far enough back to miss the important work being done today in the field of psychological astrology." (p. xliii) Beyond that, he bravely attempts to bridge the gap between the tender minded psychological astrologers, with their vague, but comforting client-centered language and the more tough minded yes/no approach taken by horary practitioners and other adherents to craft-oriented approaches to practice. Caves also tries to make a case for the strong presence of horary astrology prior to the modern revival of the 1980's, where he finds it "very much alive in America, even as it fell into disrepute in post-Renaissance Europe." (p. xliv). While this may be comforting to his American readers, it may be overstating things in both directions: as an American who intensively studied astrology in the mid to late 1970s, I can attest to the near absence of horary on the shelves of metaphysical bookshops. More tellingly, no one seemed to be either teaching or practicing it, if astrology conferences of that era are any guide. More strangely, horary seems to have had a greater role in the early 19th century revival in the UK —which is prior to the publication of Zadkiel's truncated version of Christian Astrology— not the early 20th century as Caves would have it.24 Still, Caves is sincere in his desire to stop the bickering among the relatively small astrological community, and for this he is to be commended. More to the point when it comes to the Lilly text, readers will relish some of Caves' lengthier footnotes, which are often quite illuminating. Take for instance, Lilly's discussion of Simon Forman, that "notorious astrological physician of London", a contemporary of Shakespeare's and a brilliantly unstable polymath, who practiced astrology, magic and medicine fifty years before Lilly.25 In eleven short pages, Caves produces fifteen useful footnotes, three of which take up several pages by themselves. For readers unfamiliar with Forman, Caves provides crucial social context regarding his scandalous involvement with the Countess of Essex and other courtiers in the service of King James I. In another long footnote, Caves offers his own interpretation on an unpublished judgment made by Lilly as to whether "Dns Prickman if his Mrs should live?" He helpfully provides both the chart data and the horoscopic particulars as to why Lilly rendered the judgment ("Shee died within a fortnight") he did. For anyone new to horary astrology, or Lilly's idiosyncratic prose and seeming indifference to his reader's comprehension, Caves' extra information will come as welcome relief. We are left to appreciate our choices when it comes to Lilly. All three books on review have their merits: the first as a highly readable, well researched introduction to Lilly's important role during the English Civil War; the second provides a powerful reminder that Lilly's world was not the one we share, as made evident by the handy compendium of rare Lilly artefacts they adduce; and the last as a carefully annotated, beautifully crafted version of Lilly's "Life and Times". Their collective appearance —a veritable bouquet of Lillys— signals how far things have come since Keith Thomas introduced Lilly to a wider readership. A little more than a generation ago, Lilly's pamphlets and other publications were virtually unobtainable; now they are available through Google books and in the more refined efforts of Philip Graves' DVD series. Then, the only version of Christian Astrology available, apart from those expensive tomes found on the shelves of rare book dealers, was Zadkiel's bowdlerized "An Introduction to Astrology: with Numerous Emendations, Adapted to the Improved State of the Science". Zadkiel reduced Lilly's masterwork to a rump of its original self, while his "Emendations" and expressly negative views on horary astrology created a confusing hodgepodge for the reader. In her Epilogue, Catherine Blackledge reminds us that things hadn't substantially improved by 1971, when Derek and Julia Parker's influential The Compleat Astrologer cavalierly dismissed horary as "too absurd for consideration." (p. 204) Mercifully, their views now seem as quaint as Zadkiel's ponderous judgment that "ASTROLOGY IS DESTINED TO FLOURISH WHILE THE WORLD ENDURES". No one takes that optimistic sentiment for granted anymore, but the efforts of these astrological scholars should help ensure that Lilly won't be so easily dismissed by future historians. Lilly aficionados may simply cast a horary asking: "Which book should I purchase first?" The rest of you should cue up that old Who song and sing a salute to your colleagues for reminding us why Lilly still deserves our undivided attention. 1 ] Keith Thomas, Religion and the Decline of Magic, (Charles Scribner's Sons, New York, 1971), William Lilly, Christian Astrology: Modestly Treated of in three Books, (Regulus, London, 1985); Bernard Capp, English Almanacs 1500-1800, (Cornell University Press, Ithaca, 1979) p. 57; Derek Parker, Familiar to All: William Lilly and Astrology in the Seventeenth Century, (Jonathan Cape, London, 1975) p. 127; Geoffrey Cornelius, The Moment of Astrology: Origins in Divination, (The Wessex Astrologer, Bournemouth, 2003); Ann Geneva, Astrology and the Seventeenth Century Mind, (Manchester University Press, Manchester, 1995); Patrick Curry, Prophecy and Power: Astrology in Early Modern England, (Polity Press, Cambridge, 1989) p. 31. 2 ] Christian Astrology: Retyped and Annotated by Deborah Houlding, (Ascella, London, 1999 and 2001); John Frawley, (Ed.) The Astrologer's Apprentice, (London, 1999-2007); Nick Campion, A History of Western Astrology, Volume II: The Medieval and Modern Worlds, (Continuum, London, 2009) p. 151. 3 ] The Last Magician, back cover description. 4 ] See Nick Campion, "The Traditional Revival in Modern Astrology: A Preliminary History", Astrology Quarterly, (Winter 2003) pp. 28-38, and Deborah Houlding's "Prediction, Providence & the Power of the 'Self' in Horary", on Skyscript, but originally published in a shorter form in The Traditional Astrologer magazine, Issue 17, Sept. 1998. 5 ] Ibid., p. 257. 6 ] A Brief History of Britain: 1485-1660, (Constable & Robinson, London, 2008). 7 ] Author quote is taken from the front paper of The Man Who Saw the Future. 8 ] Geneva, op. cit. p. xiv. 9 ] Ibid., pp. 2 and 10. 10 ] Life and Times, (Rubedo Press, Auckland, Seattle, 2015) p. 62. I have used their version, since it has the most straightforward orthography. Other editions seem to randomly capitalize certain words and add extra letters. 11 ] Lilly's mastery of astrology may also be attributed, at least in part to hard study; in his autobiography, he admitted to studying "those bookes I had obtained, many tymes 12 or 15 or 18 houres day and night." The Last Magician, p. 58. 12 ] Perhaps not such a stretch: Lilly references one of Fludd's works in the extensive bibliography of his Christian Astrology, where he states that he "hath wrote much Astrology, he may justly be accounted the mirrour of our times." 13 ] The Last Magician, op. cit. p. 87. 14 ] Ibid. p. 124 and 126. 15 ] Richard Cavendish, A History of Magic, (Arkana/Penguin, London, 1987) p. 67. 16 ] Richard Kieckhefer, Magic in the Middle Ages, (Cambridge University Press, Cambridge, 1989) p. 12. 17 ] Ibid. p. 38; Daimones or daemons, as guiding spirits, may be traced to Alexandria in the second century BCE. See Dorian Gieseler Greenbaum's "Calculating the Lots of Fortune and Daemon in Hellenistic Astrology", Culture and Cosmos, Vol. 11 no 1 and 2, pp. 163-187. The reintroduction of daemons in contemporary astrology may be traced to Geoffrey Cornelius in his Moment of Astrology: Origins in Divination, (The Wessex Astrologer, Bournemouth, 2003; originally published by Arkana/Penguin, London, 1994). See pp. 178-9 for his description of their role. 18 ] The Last Magician, op. cit. p. 298. 19 ] Ashmole had assisted Lilly with the preparation of Christian Astrology the previous fall and would have been aware of the extensive number of books on hermetic magic and Islamic astrology Lilly owned, making this an ideal gift. CA's bibliography makes this apparent. As regards his book burning, after a recounting of various magical practices with his clients, Lilly states "but I grew weary of such imployments, and have since burned my books, which instructed those Curiousitys" (Stockinger and Ward, p. 67). 20 ] Lilly's "Life and Times" was not published until 1715. No doubt, things heated up between the two men after Gadbury was stung by remarks Lilly had made about the bad side of Scorpio, his rising sign. Gadbury responded with a book Obsequium Rationabile attacking Lilly. Lilly's defense was mostly carried on by his partisans in a series of broadsides and tracts. See James Herschel Holden's Biographical Dictionary of Western Astrologers (AFA, Tempe, 2012) for a summary and a fairly positive biographical sketch of this unhappy man. 21 ] Curry Prophecy and Power, Op. cit. pp. 38-9. 22 ] The lagging footnote is # 399. The missing footnote, # 145 appears on p. 85; the duplicates are # 59 and # 143; and the one with missing text is # 190 on p. 103. 23 ] The Last of the Astrologers, Edited by Katherine Briggs (The Folklore Society, London, 1974); curiously, this version of Lilly's "Life and Times" is omitted from Philip Graves' otherwise fine survey contained in the book's preface. Brigg's annotations are excellent for people and places, but less helpful for astrological terms. It speaks volumes about the state of astrological literature of the 1970's, that the only version of Christian Astrology in her short bibliography is Zadkill (sic)'s bowdlerized edition, strangely from Bohn Library (1875). 24 ] I still recall being astonished when Astrology Today, the precursor to Mountain Astrologer dedicated a whole issue to horary in their April/May 1977 issue. Nothing in the issue suggests a revival was at hand. As to horary astrology's presence in the early 19th century, see Philip Graves' DVD From Sibly to Simmonite: Source Texts of the 19th century English astrological revival 1784-1854, and my review of it highlighting horary on this website. 25 ] See Barbara Howard Traister's The Notorious Astrological Physician of London: Works and Days of Simon Forman, (University of Chicago Press, Chicago, 2001) for an interesting study; naturally, as an academic she is hostile to astrology, but it contains much helpful information.